Enjoy this small taste of the upcoming Nagila V’nismicha CD which will be in stores shortly! 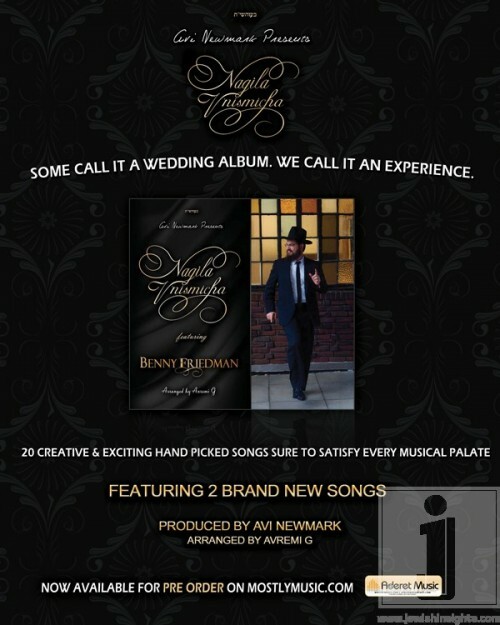 The album is produced by Avi Newmark, features Benny Friedman on vocals with arrangements by Avremi G. The album has 20 creative and hand picked songs sure satisfy every musical palate. The CD also contains two brand new songs composed by Elimelech Blumstein and newcomer Mendy Fisch. The CD is available for pre order now at $13.99 on MostlyMusic.com, the album is being distributed by Aderet Music.